What a wonderful surprise! 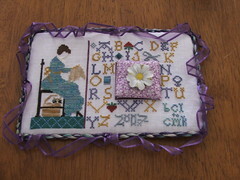 Barbara got to stitch for me in the “Our Love of Needlework” exchange hosted on the Stitching Bloggers Exchange Board. I just love what she has created for me, especially as she included Felix under the stitchers chair. It’s a truely beautiful piece that I will always treasure. Thank you Barbara! You can see the entire package here. Also in the mail today – another package from the Netherlands – I won one of Ash’s recent eBay auctions (I picked up Blackbird Designs’ Strawberry Garden with the thread and fabric required). Wow, the colours are just stunning on that one. I loved watching Nicki stitching this design earlier this year and knew I would have to try to get it too. Now it is mine, all mine! Here is my most recent start. 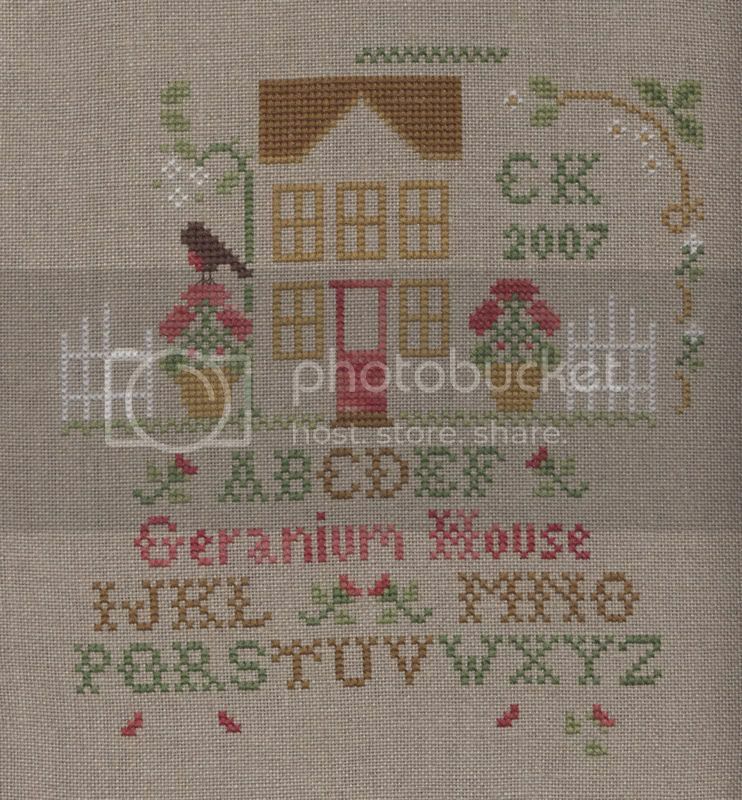 Country Cottage Needleworks’ Geranium House. I started this on Sunday Afternoon at my friend Janine’s house. I was visiting for a stitchy day. I worked all morning on Home of a Needleworker (update coming soon) but also had the materials for this on in my bag and the ladies suggested I could start it before I left them, so I put a few stitches into the door and the front doorstep. It turns out I couldn’t put it down and I have been working on it quite a bit and I hope I may even finish this before the end of the week, we’ll see.